and a search for a new police chief, one nationally prominent candidate for top cop in Chicago and other cities is a Memphis hometowner. Strickland was reported as saying February 15 that the city would retain the search services of the International Association of Chiefs of Police and that the process would begin within three weeks. More than 11 weeks later, the city has just finished getting its information to the search organization, and the job was officially posted late today May 6. Deadline for submissions is June 17. While Memphis has an interim chief in place, and the mayor would say, better to get it right than get it fast, movement on a new chief would quell clamor and uncertainty. The Chicago Police Board sifted through 39 candidates and spent $500,000 to conduct a search for a new superintendent of police after Garry McCarthy was fired in the wake of a scandal over a police officer killing 17-year-old Laquan McDonald. One of three finalists for the Chicago job was former Spokane, Washington, police chief Anne Kirkpatrick, who grew up in Memphis and served as a patrol officer for more than three years in Memphis, 1982-1985. If there is any comfort to Memphians in knowing that other cities have trouble getting out of their own way, consider this: Chicago Mayor Rahm Emanuel rejected the board’s three candidates and named his pick from the existing Chicago police force – but only to be an interim chief, replacing the “old” interim chief of five months. Sources close to Chicago's search for a new chief say Emanuel offered the job to DeKalb County, Georgia, director of public safety Cedric Alexander, but then withdrew the offer under pressure from certain Chicago council members and political powers who insisted on a local guy. Alexander, along with Kirkpatrick, were the top two police chief candidates -- not from Chicago -- who were selected during that city's search. Strickland has asked interim Director of Police Services Michael Rallings to apply for the permanent post, and Rallings says he will apply. There are two schools of thought on the subject of a new, permanent chief – that it should be someone who came up through the ranks of the Memphis department, or it specifically should be someone with a fresh perspective from outside. If any candidate is uniquely positioned to bridge both those concepts it is Kirkpatrick, who presently travels the country as an instructor for the FBI's Law Enforcement Executive Development Association. As such, she teaches leadership to executives in local agencies and covers such topics as the problem employee, credibility, discipline and liability. This week Kirkpatrick was in Arizona teaching a class. But, it seems Memphis is never far from her mind. In fact, Kirkpatrick’s’ parents and two brothers live in Memphis, and she seems to find herself in Memphis regularly – sometimes for work with the FBI and sometimes to visit – as recently as last weekend. “I’m a change agent,” Kirkpatrick said while on a break between class sessions. “I think I would be a good fit for Memphis. “Memphis has almost double the murder rate per capita as Chicago,” Kirkpatrick noted. “What I am looking for is to be a part of a city and police department that wants to really change the culture of violence,” Kirkpatrick said. “Chicago met that criteria. Memphis meets that. “I want to come into an agency that struggles or has some major issues, and I want to be part of the healing of that. I actually think I would be a good healing leader for them and could set them on a course for an excellent future. “As a community, too, Memphis needs to not accept the level of cultural violence that they have accepted. They play a part in that as well. “If I were to apply for the Memphis job it would be as an outsider with an insider’s foundation,” said Kirkpatrick, who also is a licensed attorney in Washington. Kirkpatrick says she will not apply if it appears the mayor, who appoints the director with city council’s approval, already has his pick in mind. “It depends on whether Mayor Strickland has an heir apparent or not. If he does, I would not apply,” said Kirkpatrick, who encountered such a scenario in Chicago. “I’ve been watching for the job to actually open. The job’s technically not open yet,” said Kirkpatrick, referring to the fact that the Memphis chief’s job had not yet been posted on the IACP’s website. The job officially posted late Friday May 6. A link to the job posting and other sources are at the end of this story. Kirkpatrick’s views seem to align with Memphis-specific criteria the city is looking for the IACP to find, according to Strickland's PR director Ursula Madden. Madden said the city’s contract with the police search organization is about $40,000 for the consulting work. Kirkpatrick grew up near Audubon Park and was graduated from Hutchinson School in 1977. She earned a master’s degree in counseling at Memphis State University (now University of Memphis) while she was on the Memphis police force. She left in 1985 to attend Seattle University Law School, from which she got her J.D. in 1989. Kirkpatrick’s last executive position at a law enforcement agency was 2012-2014 as the chief deputy sheriff for King County, Washington (Seattle). She had retired as Spokane’s chief of police after serving 2006-2012. 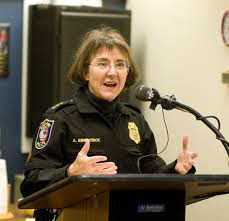 Kirkpatrick also has been police chief of Federal Way, Washington, a suburb of Seattle, and Ellensburg, Washington. “Every move was upwardly mobile,” Kirkpatrick said. “I’ve had a lot of major cities look at me, but I don’t apply to many of them that recruit me. But, to be a finalist in the second largest police department in the country is a big deal. The second “outsider” recommended by the Chicago Police Board was Dr. Cedric Alexander, a public safety administrator in DeKalb County, Georgia. Alexander last year served on President Obama’s Task Force on 21st Century Policing. The task force report lists trust and accountability as the top requirement for effective policing, and it says police culture must embrace a role as guardians rather than warriors. This may sound way too logical, but wouldn’t it be worth Memphis’ time and dime to look closely at two national candidates that Chicago identified after spending half a million dollars to figure it out? Of course, now that Memphis’ national search is finally underway, Kirkpatrick and Alexander could apply and be vetted by the International Association of Chiefs of Police. “We’ve had a change in administration. We had a police director when we started in January, and he took another position,” Madden said in defense of the fact the job had not been posted as of May 5, two months later than Strickland had told the press. The media keeps reminding Strickland that he ran on a campaign promise to reduce crime, and there were 78 homicides in Memphis through Wednesday, May 4, this year. Truth is, campaign rhetoric and more police on the street don’t touch the underlying causes of crime – income inequality and lack of opportunities. Police can investigate and solve crimes, but prevention is more in the province of the community and public policy. As for retaining a permanent chief of police – whether he or she comes from within or without MPD – Strickland no doubt would say what he has said about the implementation of body-worn cameras: better to get it right than get it fast. At the same time, stakeholders would like to have the job settled and move ahead with the next chief. Strickland has said that about $250,000 seems to be the salary level of comparable cities and that Memphis may need to increase its pay rate to obtain the next chief. Former director of police services Toney Armstrong had a salary of $126,001.46. Strickland increased that to $150,000 when he took over as mayor in January. IACP assistant director of programs Ken Kohlhepp says that his organization customizes their search process to the special requests and needs of the municipality-client, and they meet with city officials to get a feel for things. “We have a dialog with the agency, and we tailor the scope of services to what they need,” Kohlhepp said. “We come on site and talk to a variety of stakeholders and tailor our work around what we find out and our research on the agency.